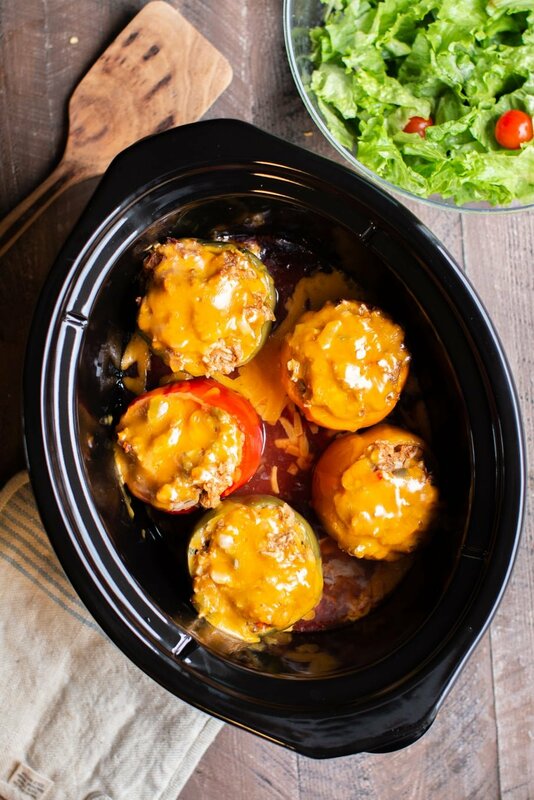 Slow Cooker Taco Meat Loaf Stuffed Peppers are a fun way to switch up your standard stuffed pepper recipe! Hi all! 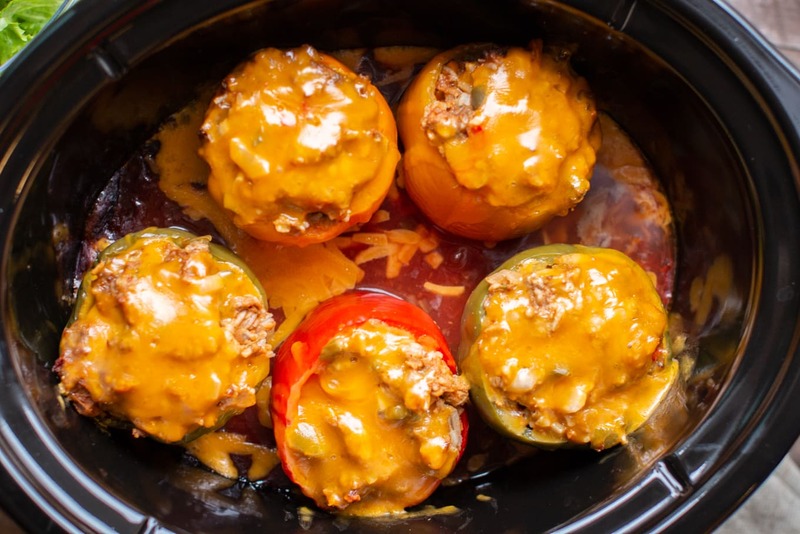 I think stuffed peppers were one of the first slow cooker recipes I made. A co-worker from Marie Callender’s told me all about her favorite recipe years ago, it was something my mom never made. Since then I have made variations, some the meat is browned first, if it is done that way the meat and rice are loose in the pepper. This recipe is a meat loaf mixture with minute rice inside of the pepper, no need to brown the meat, or pre-cook the rice. I used taco flavors in this recipe, taco seasoning, salsa and sour cream are a part of the meat loaf mixture. I also use salsa as the sauce under the peppers. Have a great weekend I will be back on Monday with another recipe! Add the 1½ cups salsa to the slow cooker. Cut the tops off the peppers remove and discard the seeds. Don't throw away the tops, chop up the top of the pepper and add to the meat loaf filling. In a medium sized bowl add the meat, diced tops from the bell peppers, onion, egg, sour cream, salsa, taco seasoning mix, crushed saltine crackers and rice. With clean hands mix the meat loaf ingredients together until just combined, don't over mix. Stuff the peppers with the meat loaf mixture. Place the stuffed peppers on top of the salsa. After cooking time is done add a ¼ cup of cheese to each pepper. Add the lid back on the slow cooker and let the cheese melt, it will only take a few minutes. Nutritional values are approximate. Pleases use your own calculations if you require a special diet. Value are for 1/5 of the recipes. I used my 6-quart oval slow cooker for this recipe. Love your recipes, Sarah! Please keep them coming. I’m going to make this one next week. Thank you Sharon! I think you’ll love these! Do you have this in a low fat and low sugar receipt? I do not, you can adapt it to your diet. This looks amazing. I will be trying this very soon. You are my new best friend. I love my slow cooker and this just inspires me to make more great dishes. 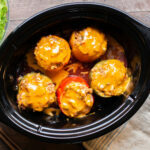 I loved stuffed peppers but I would never have thought to fill them with taco meat! Thanks Sarah! Thank you ! 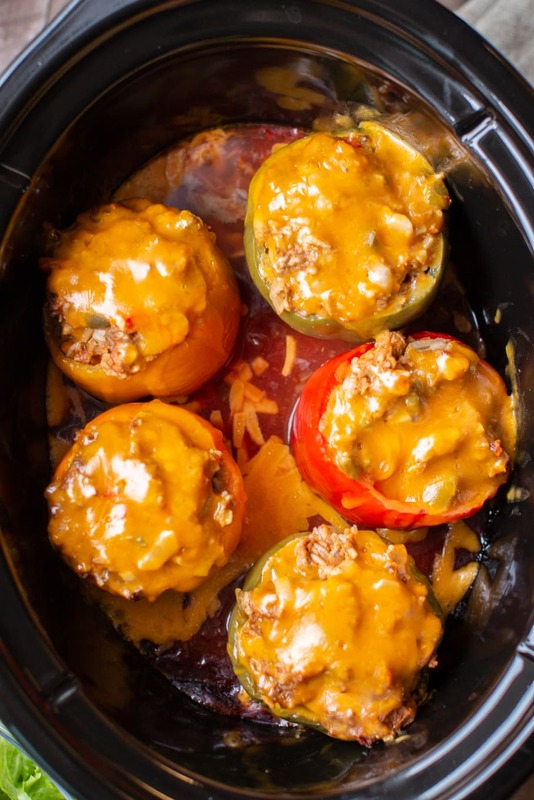 I have been looking for a recipe for stuffed peppers in the crock pot/slow cooker. This one certainly looks delicious ! This is the 3rd or 4th recipe I’ve made from you and I’ve enjoyed each one! My peepers are cooking now and they smell delicious!!!! Can’t wait! I love all your recipes!!! Just found your web page and I’m so glad! Your recipes are inspiring and look so yummy! THANK YOU! Could I make this with Spanish Rice instead of White Rice? Please Advise. Thanks! Am I able to substitute Spanish Rice in place of White Rice? Please advise. Thanks! Do you think I could put big slices of onion on top of the bell peppers?? We ♥️ anything Mexican and crockpot!! I love that your recipes are made with “normal” ingredients/spices!! It took an additional hour to cook the bell peppers on high. I prefer my bell peppers cooked rather than crunchy. Thanks for letting us know about the bell peppers. 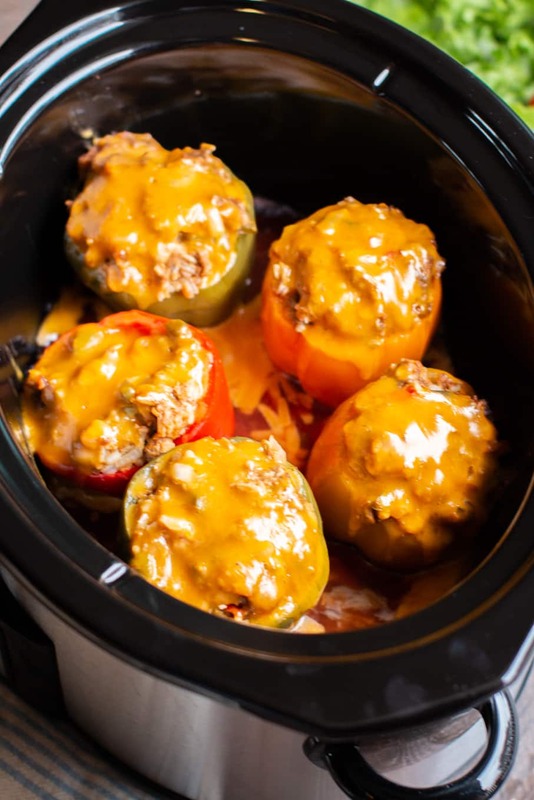 I made this recipe I hope it comes out delicious cause it looked tasty but I stuck the peppers in a roaster instead cause I only have a 4qt crock pot and I made a lot cause I’m feeding my son myself and my fiancee and my son’s grandparents on his dad’s side. I doubled the recipe is that okay cause how many people are eating them? I think that would work great. How did you like them?